Logiblocs is a plug and play electronics range for children. Logiblocs are 20 years old! We usually review the latest technology for kids, but thought we'd try these out as they're still available for sale. We got the LogiRobot, once of the larger sets and didn't really know what to expect. 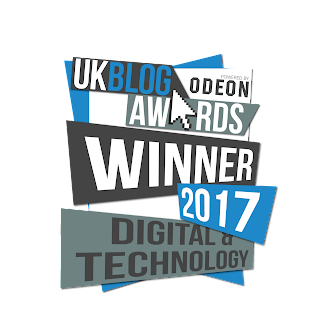 Now, we spend a lot of time with cool kid tech so our expectations are pretty high. Can a 20 year old range still engage modern kids? Let's find out. The LogiRobot set comes in a big box with plastic packaging. The box isn't particularly useful for storing the components in afterwards as its fiddly to get the parts in and out. The colours are bright and the modules are colour-coded to help understand what they do. I put batteries in the main robot and the remote. The we had to add the infrared sender and receiver modules - this makes it really clear how the remote is communicating with the robot. Set it to half-speed to get started. And it didn't work. This was because I didn't read the manual. Half-speed is disabled when you're using the remote. You need to use full-speed. Once I realised this we were able to control the robot from the robot. It's incredibly fast! Half-speed would be useful. The buttons on the remote correspond directly to the left and right motors. You press left and right buttons forward to move forward, and left and right back buttons to move forwards. This makes it really clear how the motors make the robot move. It's hard to control the robot accurately, but fun. My 7 year old immediately understood the controls, probably because he's familiar with writing code to control motors. 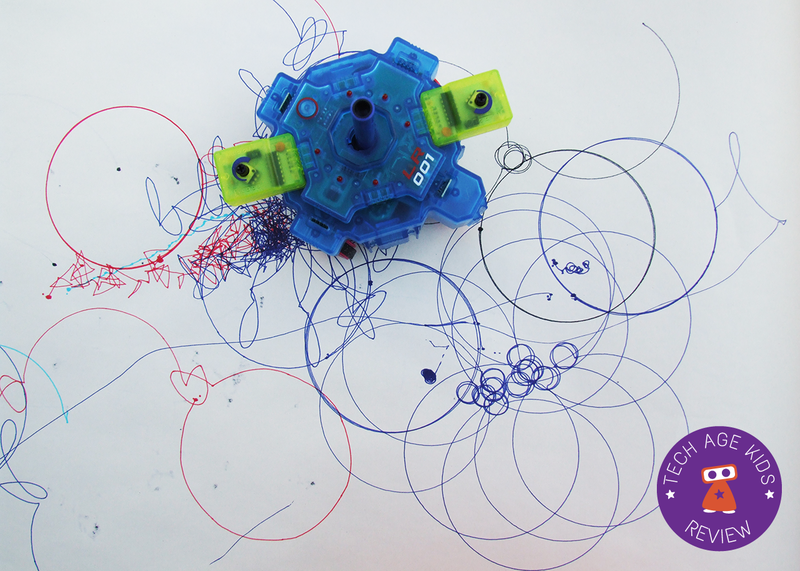 For our next project we tried drawing with LogiRobot. We got a big sheet of paper and put in the penholder and pen. We attached the two light sensors to the robot, one to control each motor. The connections are a bit stiff so it's a bit tricky to attach the add-on modules. Once the light sensors were in place my 7 year old was able to make the robot draw by shining a light on one or both sensors. He thought this was brilliant! The robot drew perfect circles when he shone the torch just on one sensor and he could make interesting patterns by varying where the light shone. Very cool. 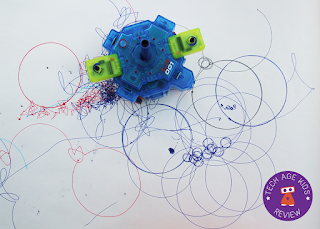 Then we tried a drawing bot project from the booklet which uses pulse modules to control the left and right motors to create interesting patterns. The boys were fascinated with this and we spent a long time trying different settings and working out why we were seeing particular patterns. The LogiRobot isn't just a floor robot. You can put it on the included base and attach pulleys to the wheels. This is a fantastic idea. It makes really good use of the hardware. We built a lift for Playmobil characters. This was really simple and just worked. My 7 and 9 year olds had loads of fun with this. The manual instructions helpfully tell you that 80g is about the right weight for a load. 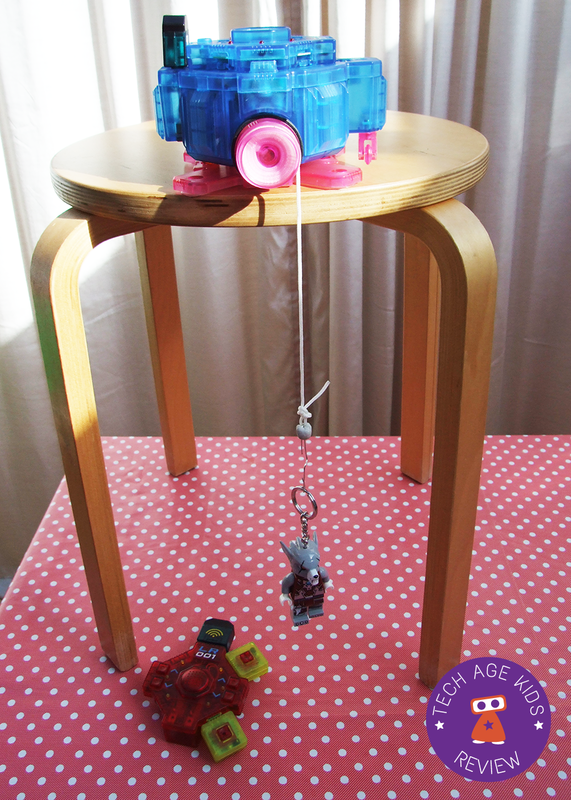 So my kids had fun weighing small toys and teddies to see who could have a ride. At first we attached buttons to the robot base unit. Then we switched to controlling the pulley from the remote control. The LEGO Chima torch in the video weighs 30g so it's well within the limit. 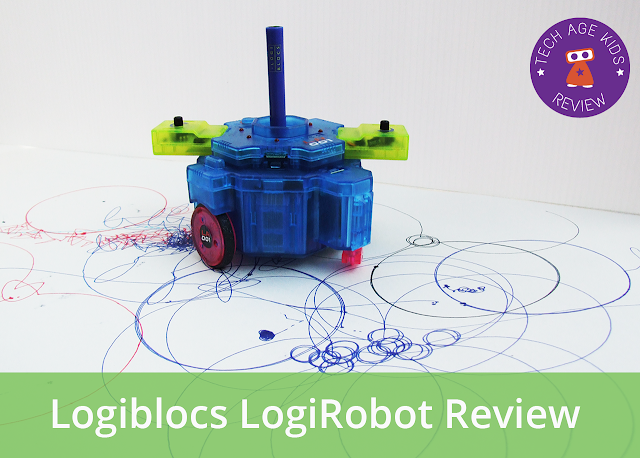 The LogiBlocs robot set comes with a printed booklet with lots of project ideas. 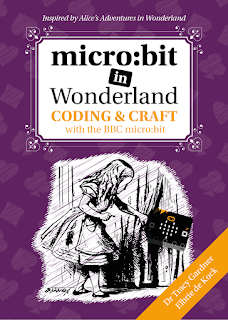 There's a really great range of projects including drawing interesting patterns by controlling the drawing robot with pulse input blocks to knocking teddies of the shelf to surprise someone when they enter a room. We're so used to using programmable robots that it's really interesting to stop and see what you can do without coding, just by connecting inputs and outputs in interesting ways. The remote control has a speaker and generates different tones when different buttons are pressed. It's quite noisy! 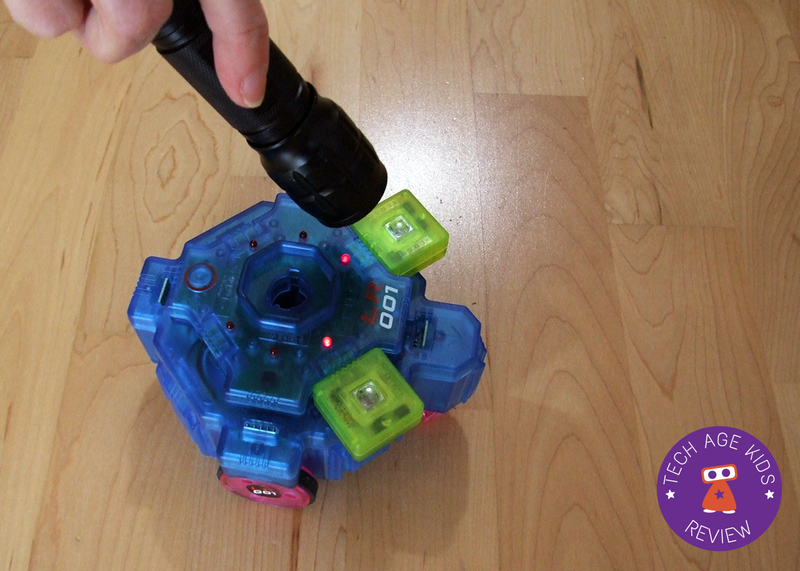 The robot itself doesn't make a noise (other than the sound of the motor) so it can be used quietly. The robot base should be set to full power when using the remote and half power without. 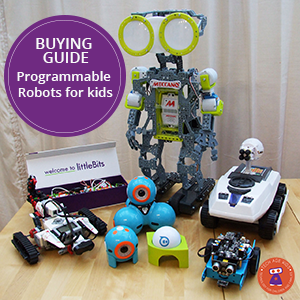 You need 4 x AA batteries for the robot and one 9V battery for the remote. Some of the projects require other items including black tape and white cards. You'll also want some large sheets of paper to draw on for the drawing robot. Some fine felt tip pens would be useful for variety - one pen is included. There's no way to connect Logiblocs to a computer to program it. Overall we really liked Logiblocs. The parts were a little tricky for the kids to get together and the stiff wires made positioning tricky when they were used. We found it hard to remember when to put the robot on to half power and when to have it on full power. We were a bit concerned about durability as the information booklet gives so many warning about being careful, the plastic may be a bit brittle but it actually feels fairly sturdy. The ability to use the robot as a floor robot that can drive around and as a fixed base with pulleys really adds to the value of this set. This design has been really well thought through and really add value. We also really like that you get two of several of the add ons. So many things that you think of making need a pair of inputs. Often you only get one and it limits what you can do. Because the range has been around for a long time you might be able to pick up used Logiblocs sets and add-ons on eBay (as well as new sets) to build your collection. Logiblocs isn't programmable from a computer. This is one of the reasons it has lasted so long. 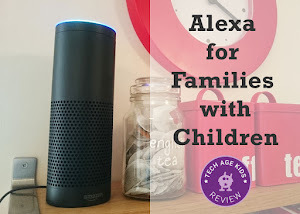 But sometimes it's good to have a tech toy that gets kids away from the computer. If you want an electronics set that allows kids to make a variety of practical projects but doesn't require lots of craft items to make it work then Logiblocs is still a contender in 2016. Sometimes my kids want to get the craft stuff out and build something from scratch, other times they just need a quick invention as part of a game they are playing and Logiblocs is great for that. 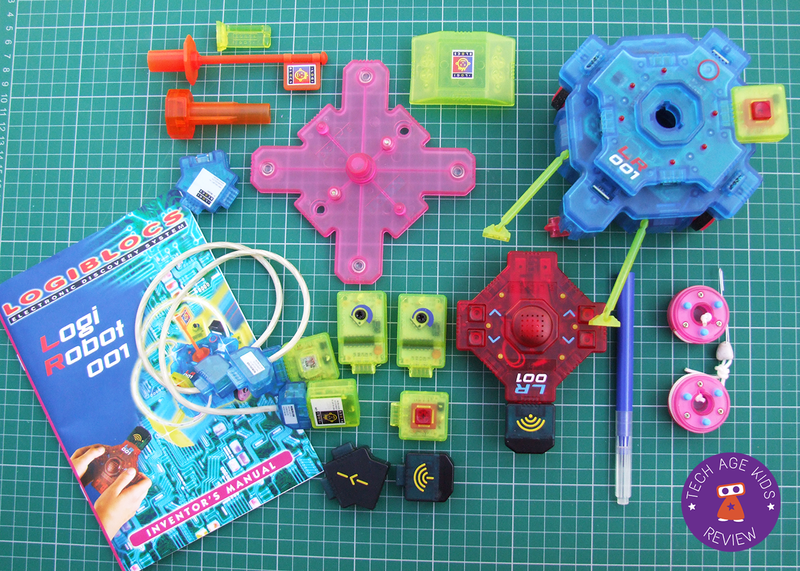 Logiblocs launched in 1996 with the goal of making electronics fun and accessible to children. Logiblocs sets are available for schools and as kits for home use. Logiblocs is a UK company but distributes its products internationally including the US. We'd love to see more from Logiblocs. If they came up with this in 1996 and everyone else is just catching up in the last few years, what could they come up with in 2016 and beyond? You might also like: the BigTrak programmable floor robot.